You may be looking for Monkey Island and not even know it! 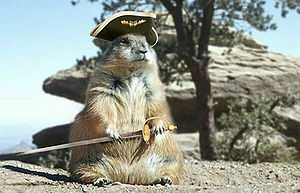 Captain Squeakbeard, the plundering storm of the Caribbean until 1823. The Pirates of the Caribbean are a seafaring tribe originating from Castaway Cay. In the past, the Pirate people often threatened ships on the high seas, frequently seizing their bounty. However, in 1956, the Pirates were conquered by the Disneyland Confederation and dispossessed of their lands. Today, most of the Pirates live on a small reservation in New Orleans Square within the Disneyland Confederation, though there are small populations who live within other states belonging to the Mickey Mouse League. The origins of the Pirates of the Caribbean are unclear and shrouded in controversy. According to Pirate traditional belief, Castaway Cay is the center of the cosmos. Pirate creation myth maintains that the god Animatroní created the Pirates as masters of the sea and all of its bounty. Archeological evidence seems to indicate that Castaway Cay became settled by the Pirates around 400 CE. The original homeland of the Pirates of the Caribbean is unknown, though there is some tantalizing evidence that the Pirates are descendants of tribes located in Québec. During the Five-Day War, the Disneyland naval fleet quickly overwhelmed the pirates. Following their traditional beliefs, the Pirates of the Caribbean raided ships in both the Atlantic and the Pacific. They gained a fearsome reputation on the seas, particularly in the Gulf of Mexico. Unfortunately, the Pirate traditional way of life came into conflict with the Disneyland nations. In 1955, following the Treaty of Corporation, the newly independent Disneyland Confederation looked to the seas for trade. However, the Pirates of the Caribbean made frequent raids on Disneyland ships, confiscating their cargoes of movies and licensed merchandise. These raids significantly impacted Disneyland commerce. The Pirates of the Caribbean problem was one of the first issues addressed by Mickey Mouse the Great after he came to power. In 1956, under the command of Admiral Donald Duck, a Disneyland armada attacked the Pirates of the Caribbean in Castaway Cay. Disneyland’s navy, with superior technologies developed by Wernher von Braun, quickly overwhelmed the Pirates. 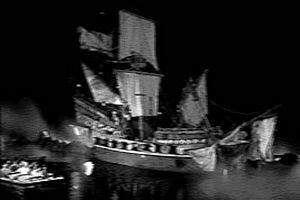 The Pirates of the Caribbean issued a surrender 5 days after the onset of the attack. The Five-Day War marked a pivotal event in the history of both Disneyland and the pirates. In the terms of surrender, the Pirates of the Caribbean lost their ancestral homeland. The Pirate population was forced to live on a small reservation located in New Orleans Square within the Disneyland nations; most of the reservation was located in a cave below ground. Castaway Cay became a naval military base under Disneyland rule, and remains so to this day. Some of the Pirates were forced to participate in humiliating public displays for tourists. Life under Disneyland land rule was tough and unbearable. Deprived of their traditional Pirate ways, the Pirates of the Caribbean came to lead an impoverished existence. Some were forced by circumstances to participate in humiliating public exhibitions for tourists. 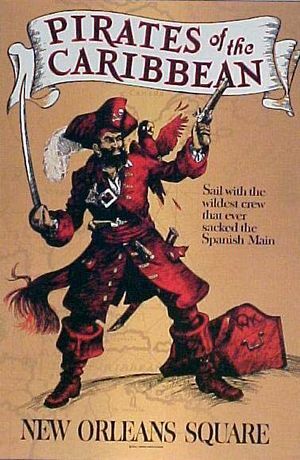 In 1967, in an attempt to address Pirate grievances with Disneyland, radical elements of the Pirates of the Caribbean formed the Pirate Liberation Organization, or PLO. The PLO turned to terrorist activity, engaging in bombings, kidnappings, and threatening to eat the tourists in Disneyland. Sporadic terrorist attacks by the PLO in Disneyland continued through the late 1960s and 1970s. 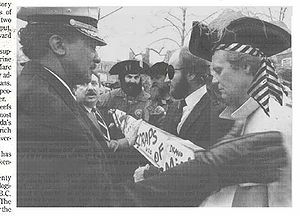 By the 1980s, it appeared that the PLO had disbanded. However, shocking attacks by the PLO on the Skyway in 1994 and the PeopleMover in 1995 and the recent upsurge in violent attacks indicate that fringe elements PLO continue to operate today. The peaceful revolution in 1970 and democratization of the Disneyland Confederation created a new zeitgeist of freedom which led to new policies that meaningfully improved Pirate life. The establishment of the new Mickey Mouse League alliance created greater prosperity which eased some of the worst deprivations suffered by the Pirates of the Caribbean. Improvements in the status of the Pirates of the Caribbean have however been set back by the ongoing PLO attacks, which have created an atmosphere of suspicion among Pirate communities in Disneyland. In this new era of terrorism, Pirate legal groups have had to work hard to preserve civil rights protections and to end arbitrary detention of Pirate suspects. These new pressing matters have meant that work on more mundane matters such as preserving native Pirate culture and relieving endemic Pirate poverty has received less priority. 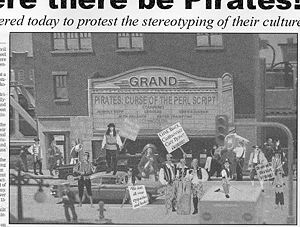 A NAPA protest against demeaning portrayals of pirates in the media. Despite this, the National Association for the Advancement of Caribbean Pirates (NAACP) continues to lead campaigns calling for improved media depictions of the Pirates of the Caribbean. When the film Pirates of the Caribbean: The Curse of the Black Pearl was released, it elicited massive protests from the Pirate community. Its stereotyped depictions of the Pirates of the Caribbean were denounced by activist groups as insensitive and demeaning. Movie studio executives met with NAPA representatives to address their concerns. As a result of the meeting, Pirate representatives were allowed to make script changes to the movie’s sequels so that they could present a more realistic and nuanced depiction of Pirate culture. Pirates stage a demonstration protesting the occupation of Castaway Cay. NAPA has been also leading efforts to restore control of the ancestral homeland of Castaway Cay to the Pirates of the Caribbean. The status of the Pirate ancestral homeland is an extremely contentious issue. Some radical Pirate elements are demanding an immediate withdrawal of the Mickey Mouse League’s military from Castaway Cay and the dismantling of the naval base located there. Others hope for a compromise that would meet the military’s needs while still respecting Pirate ancestral land. This page was last edited on 9 March 2012, at 16:32.